Chad DeKold is still getting used to the feel of his Citadel ring on his hand. Unconsciously, he turns it around and around on his finger as he talks. The weight of the gold ring was unexpected. 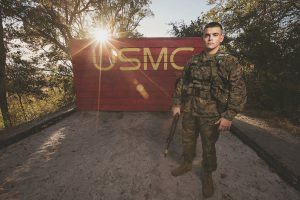 It is a constant reminder that he is a senior at the Military College of South Carolina and that graduation is almost within his reach. The ring is a reminder, too, of all that he has achieved to get to this point. 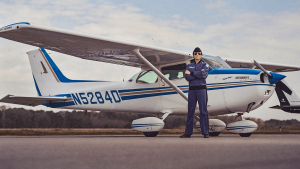 Judging by the last three years of DeKold’s resume, there are few opportunities that the Johns Creek, Georgia, native did not take advantage of during his cadet career. DeKold is an Army ROTC contract cadet double-majoring in Intelligence and Security Studies and International Politics and Military Affairs. A member of the Honors Program, he is also minoring in Chinese. He studied Mandarin at a Taiwanese university as part of the Department of Defense’s Global Officer Program. He has served on the Ethics Bowl Team and was the organizational leader of The Journey, a Presbyterian student ministry. He was a member of the Cordell Airborne Ranger Society, and he is a member of the Summerall Guards, the elite precision drill platoon at The Citadel. He wears Gold Stars awarded for academic excellence, and he currently serves as commander of Second Battalion. Yet DeKold’s proudest accomplishment is an award he received as the Hotel Company first sergeant when the company’s freshman class voted DeKold the most inspirational leader. The award has spurred DeKold to be an even better leader. In September, just weeks before DeKold received his ring, Hurricane Florence, a Category 4 hurricane when it made landfall, threatened the Carolina Coast, giving cadets an unexpected vacation. 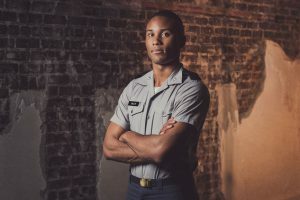 As DeKold was contemplating his time off, Cadet Logan Barber approached him. Barber, who had assisted with hurricane evacuation shelters in 2017, was recruiting cadets to help with some of the Red Cross shelters. DeKold and several other cadets gave up their hurricane leave to help manage a shelter at Creekside High School in North Charleston for people whose homes were threatened by the hurricane. The challenge was more than anyone bargained for. The shelter was overwhelmed with 200 more people than the Red Cross had expected. The cadets quickly went to work, taking over the management of the shelter. They dealt with issues ranging from overcrowding to making sure that there were adequate supplies. They worked grueling shifts, up to 20 hours for five days, serving mothers and their children, people with disabilities and the elderly. But it was the other volunteers—the freshmen cadets—who made the strongest impression on DeKold. After a particularly long shift, DeKold was tired and ready to be home when he noticed one of the freshmen helping out the evacuees. In that moment, DeKold had come full circle. The class of cadets who had voted him the most inspirational leader was now inspiring him. And DeKold, like any good leader, recognized their sacrifice and their hard work. Weeks later, with the weight of gold now a constant reminder of his Citadel experience, DeKold is ready to take on his next leadership challenge.